Sgt. Rossi: Hey, how long was the 100 Years War? Capt. Beckman: Exactly 215 years. War is a terrible thing. It's that simple, and it's not. An endless stream of war films continues to be made, each of them trying to present some truth about war. Some films wave the flag to show the heroic, patriotic side. Others focus on the madness and destruction. Currently, ever since Saving Private Ryan, the trend has been to show the brutal horror of war juxtaposed against the valiant deeds of soldiers. Yet, prior to Steven Spielberg's highly touted motion picture, war films often took a satirical look at war. Some work; others are disastrous. Put Castle Keep, Sydney Pollack's 1969 anti-war satire, in the same camp as Buffalo Soldiers and M*A*S*H�it doesn't work. A group of eight American soldiers are led by Major Falconer (Burt Lancaster) to a castle in Belgium's Ardennes Forest. Falconer is an ardent hawk, as evident by his eye patch, in command of dissident men. Captain Beckman (Patrick O'Neal) is an art historian that cares for the castle upon the squadron's arrival, yet his attempts to spread the love amongst the men are in vain. The enlistees, especially Sgt. Rossi (Peter Falk), are more interested in going to the town's bordello—except Corporal Clearboy (Scott Wilson), whose affection is directed solely at a Volkswagen Beetle. As a matter of fact, the Beetle is more interesting than any of the human characters. The only scene of the movie that actually succeeds is when two of the privates try in vain to kill the Beetle by drowning and shooting it. It is the one golden moment in the middle of a story that is as dull as watching the grass grow. There is also a side story involving Count Henri Tixier (Jean-Pierre Aumont) and his countess (Astrid Heeren). The count is impotent, but desperate for an heir. He sends his wife to the bed of Major Falconer, with the explicit direction that she is not to fall in love. Obviously she falls for Falconer, though it's difficult to understand why. Lancaster is a fine actor who is normally exuberant, but here, he is a flat, lifeless brute. The rest of the cast is no better, particularly Falk. His efforts to pull off comedic banter in a scene with Bruce Dern (who plays a deserter that has started a religious sect) are painful. The only interesting character is Captain Beckman, though he narcissistically thinks that the war is directed against his love for art. Sydney Pollack's career is full of hits and misses. Castle Keep is probably the biggest miss of his career. His direction of the physical comedy is way off base, either drawing gags out past their prime or rushing through them before the audience can appreciate their value. Even worse is the climactic battle scene, which is full of loud, indiscernible noises that served only to irritate this viewer. The geography of the castle's grounds is never adequately shown, making for a disorienting experience; Michel Legrand's inapt score only accentuates this disorientation. Instead of watching this movie, go rent Catch-22, or better yet, read that book. Image Transfer Review: DVD fans will probably refuse to watch this DVD on the sole basis that it is presented in pan-and-scan, destroying the original 2.35:1 aspect ratio of Henri Decae's cinematography. 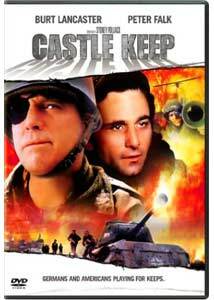 Make note, there is no widescreen edition of Castle Keep being released to DVD at this time. Also, the opening and closing credits are presented in nonanamorphic widescreen. For those who elect to watch this DVD, get ready to see a lot of talking noses. Leaving the pan-and-scan issue aside, this transfer is weak. Grain and mosquito noise are always present, with dull colors and print defects. Detail and contrast are weak, but at least fleshtones are accurate. Audio Transfer Review: Presented in Dolby Digital 4.0, Castle Keep's first few minutes contain a lot of sound separation across the main speakers and a nice use of the surround speakers for the score. However, after that, the surround speakers are never to be heard from again. Dialogue is spread across the front soundstage (sometimes without any obvious reason) and is occasionally muddled (this could be a result of the source material). Sound effects, such as exploding bombs, are not as sophisticated as they are in modern films, and they are relegated entirely to the front sound stage. Some of the sound travels across the main speakers during the final battle scene, but these moves don't appear to be in sync with the visuals. Extras Review: The original theatrical trailer for Castle Keep is presented in nonanamorphic 2.35:1 widescreen with Dolby Stereo 2.0 sound. The theatrical trailers for Black Hawk Down, The Patriot, and Tears of the Sun are also provided in nonanamorphic 1.85:1 widescreen and Dolby Digital 5.1 surround. Sydney Pollack's Castle Keep is part satire, part action, and wholly tedious. The pan-and-scan transfer, aside from destroying the original picture, contains numerous flaws and a lackluster look. The sound mix starts out promising, but becomes lifeless after the first ten minutes. The extra features continue the disappointing trend of this release. Spend your money on something else.